Coat colors range from pure white to solid black and many other variations. 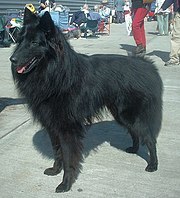 Above is a white American Eskimo dog and a black Belgian Shepherd (Groenendael). Today, dogs exhibit a diverse array of fur coats, including dogs without fur, such as the Mexican Hairless Dog. Dog coats vary in texture, color, and markings, and a specialized vocabulary has evolved to describe each characteristic. Brown: From mahogany through liver (dark brown). Yellow: From pale cream to a deep yellowish-gold tan. Gold: From pale apricot to rich reddish-yellow. Blue: A dark metallic gray, otherwise known as slate; diluted black pigment. Blue merle is genetically black, not blue. Buff: Such as the buff Cocker spaniel. All these colors can also be dilute, meaning they become a paler shade of the original color. Blue and cream are both dilute colors. The Dalmatian's coat is one of the more widely recognized markings. Bicolor: such as black and tan, red and white. The coat has both colors but in clearly defined and separated areas; usually the top and sides are darker and lower legs and underside are the lighter color. Tricolor: Consisting of three colors, usually black, tan, and white or liver, tan, and white. Brindle: A mixture of black with brown, tan, or gold, usually in a "tiger stripe" pattern. Sometimes called grizzle when the pattern is not in lines. Roan: A kind of ticking on the hair where half the fur is one color and the other half is a different color. In English Setters, this color pattern is called a Belton pattern. Harlequin: "Torn" patches of black on white. Merle: Marbled coat with darker patches and spots of the specified color. Particolor: Two-colored coat with the colors appearing in patches in roughly equal quantities. Tuxedo: Solid (usually black) with a white patch (shirt front) on the chest, and white on some or all of the feet (spats.) This pattern is sometimes called Irish Spotting, Flashy, or Boston. Blenheim: A red and white pattern found in Cavalier King Charles Spaniels. Domino: A specific facial and body pattern in Afghan Hounds caused by a certain genotype. Double-coated: Having a thick, warm, short undercoat (or down) that is usually dense enough to resist penetration by water and a stronger, rougher weather-resistant outer coat (topcoat), also referred to as guard hairs. Most other coat types are also double-coated. A special vocabulary has been developed to describe the characteristics of various body parts of the dog. 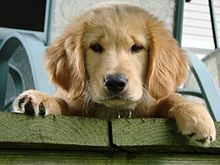 Terms are often specific to each breed or type of dog. The parts of the head are the nose, muzzle, stop, forehead or braincase, occiput (highest point of the skull at the back of the head), ears, eyes, eyebrows or brows, whiskers, flews (lips, which may hang down), and cheeks. Apple-headed refers to a dog's head that is round on top, not flat. Brachycephalic, or shortened muzzled, sometimes so short that it can lead to breathing problems, such as in the Pug. Dish-faced refers to a dog whose nasal bone is higher at the nose than at the stop. Dolichocephalic, or long and narrow, as seen in most "hounds" like a Borzoi or other breeds such as the Rough Collie and the grey wolf. Down-faced, a convex facial structure where the muzzle is turned slightly downward when looked at from the dogs profile, such as a Bull Terrier. Mesocephalic, or wedge shaped (broad skull with a narrower muzzle). Butterfly nose is of two colors. Dudley nose is a flesh-colored nose. A snipey muzzle is one that is too pointed for good breed type. The stop is the degree of angle change between the skull and the nasal bone near the eyes. Also the indentation between the eyes where the nose and skull meet. The occiput in dog terms is the bump or protuberance clearly seen at the back of the skull in some breeds like the English Setter and Bloodhound. However, in other breeds it is barely perceptible. Myths in dog folklore believed that size of the occiputal protuberance was somehow a measure of the dog's sense of smell. So to this day it is prominent in most Scent Hounds. However, technically the occipital bone extends right down the back of the head to where it articulates with the neck. So when breed standards refer to the length of a dog's skull, they rarely include the occiput in this measurement. The occiput has many nerve endings and stimulates calming effects to do with the flight or fight system. It is used in canine therapeutic massage to calm the dogs. The Basset Hound's ears are extremely long drop ears. Bat ear: Erect, broad next to the head and rounded at the tip, such as the ears on a Chihuahua or a French Bulldog. Button ear: A smaller ear where the tip folds forward nearly to the skull, forming a V, as in the Jack Russell Terrier. Cropped ear: Shaped by cutting; see cropping. Drop ear: An ear that folds and droops close to the head, such as the little known Blue Lacy. Also called a pendant ear. Rose ear: A very small drop ear that folds back; as in the greyhound or bulldog. Semiprick ear: A prick ear where the tip just begins to fold forward, as in the Rough Collie. Hound ear: Floppy ear that is long and droopy enough to collect air around the nostrils, as in scent hounds and spaniels. A dog's vision is actually equivalent to a human with red-green color blindness. Different breeds have different shapes of eyes. It all depends on the purpose. If a dog is a hunter, they most definitely need good eyesight. Therefore, those breeds have a wider range of vision than others. As a rule of thumb, breeds with short heads have a narrower field of vision, whereas breeds with longer heads have a wider field of vision - such as wolf, sighthound. Flewies are a dog's upper lips, or the canine equivalent of upper lips. Cheeky refers to a dog with strongly defined cheeks. Bite describes how the dog's teeth meet when its mouth is closed. The body may be described as "cobby" (short and square) or sometimes by a ratio of height to length. The ridge between the shoulder blades; often it is the tallest point of the body. Single suspension gallop: The dog supports its weight with its feet in the unsymmetrical sequence RF, LF, RH, LH. Double suspension gallop: The front legs are in full extension forward while the rear legs are in full extension rearward. One way a dog releases heat from its body is from in between its paws. Some dogs have a seemingly superfluous claw at the base of their foot. This is known as a dewclaw. 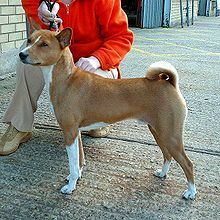 The Basenji's tail is tightly curled. Bob: Short or non-existent tail, such as an Australian Shepherd or Pembroke Welsh Corgi. ^ Candille SI, Kaelin CB, Cattanach BM, et al. (Nov 2007). "A -defensin mutation causes black coat color in domestic dogs". Science. 318 (5855): 1418–23. doi:10.1126/science.1147880. PMC 2906624. PMID 17947548. ^ a b c d e f g h i j k l m n o "Genetics of Coat Color and Type in Dogs". University of Saskatchewan. Retrieved 2013-06-20. ^ Margaret H. Bonham (2006). Dog Grooming For Dummiesʾ. New York: John Wiley & Sons, Inc. p. 27. ISBN 0-471-77390-5. ^ "Glossary". American Kennel Club. ^ Bonham, Margaret H. (2013). "Dog Anatomy from Head to Tail". Dog Grooming for Dummies. John Wiley and Sons. Retrieved 22 November 2013. Spira, Harold R. (1982). Canine terminology. San Francisco: Harper & Row. ISBN 0-06-312047-X.